Katabatic Gear is best known for their quilts, but they also make backpacks, including the Helios 55 cuben fiber pack, what I jokingly refer to as “the other white backpack.” I’ve been using the 32 ounce Helios 55 for backpacking and winter alpine ascents and it’s a great four-season capable pack, definitely worth a look if you want a multi-day cuben fiber pack (MSRP $350) with a ventilated back panel for on-trail use. A 420d nylon version is also available for $25 less. The Helios 55 is a lid-less roll top style backpack with two side water bottle pockets and a rear back pocket that’s attached to the back of the pack with stretchy Spandura (stretch Cordura) side panels. Most of the pack’s capacity is in the Helios’ main compartment which swallows a ton of gear, or the 8.7L extension collar which provides extra storage capacity. The white interior of the pack makes it very easy to see the contents while the roll top closure makes it easy to pull out whatever you need. The roll top clips together on top or using webbing straps that are anchored inside the side pockets. I prefer to buckle the main compartment shut on top, since there’s also a webbing strap that runs from the back panel between the shoulders over the top and clips to the back of the pack; although you could also anchor the ends using the side straps. Those same side straps can be run behind the pack for compression or as an extra attachment point when not in use. More on this below. The Helios 55 also has a large rear pocket good for storing layers or gear you want fast access to during the day. The back of the pocket is faced with cuben fiber for durability, while the sides are black Spandura which provides stretch and water drainage. While the fine weave is tear resistant, I wouldn’t advise taking this pack off-trail into thick brush. The pack has two side water bottle pockets, also made with the same black Spandura fabric. While I can reach behind and pull water bottles out from the side pockets, getting them back in while wearing the pack is a little trickier since the bottom compression strap and a roll top strap terminate inside the pocket. The bottom compression strap can also be routed outside the water bottle pocket, but there’s still an extra buckle inside it. The Helios 55 has two lycra water bottle pockets.The bottom compression strap can be routed outside the pocket or clip to a buckle inside the pocket. There’s an elastic cord and cord lock that runs through the top of the pocket which you can cinch closed to keep bottles or other loose gear from falling out. However, the black Spandura fabric at the bottom of the pockets is flush with the bottom of the pack and not faced with hard fabric, making it a potential point of abrasion or tearing. The Helios 55 has two tiers of compression straps. There’s also a webbing strap that runs from the back of the pack over the roll top which can be used to lash gear, like a sleeping pad to the top of the pack when full. The compression straps have complementary male and female buckles so they can be re-routed behind the pocket to lash bulky gear to the outside of the pack, such as the sleeping pad or snowshoes shown above. This is a really thoughtful touch that eliminates the need to buy additional webbing straps or rig up your own cord lock-based attachment system with accessory cord. While the compression straps are just long enough to attach snowshoes to the back of the pack, I do wish they were a few inches longer. There are a few gear loops on the pack which can be used to rig up custom attachment points: two above the shoulder straps on the front of the pack and four on the periphery of the back stretch pocket. The pack also has a single ice axe loop on the right hand bottom of the back pocket. The Helios 55 has a frame that consists of a center aluminum frame stay and a stiff foam pad which backs a ventilated mesh back panel behind the shoulder straps. These are locked in place in an internal pocket which can be opened and accessed from the pack’s main compartment. 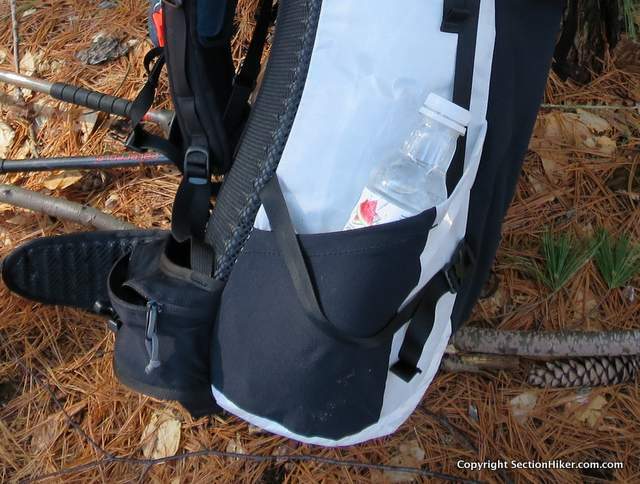 (There are three loops on that pocket lid that you can hang a hydration reservoir from.) The frame stay is removable so you can bend it to fit your body shape, if required. The hip belt wings are sewn directly to the base of the pack providing excellent load transfer and control. However since the hip belt is non-replaceable, you’re going to want to make sure that the padded part of the wings covers your front hip bones for maximum comfort. I tested a size medium and the hip belt wings just barely covered my hip bones (I have a 36″ waist) even though the size medium’s specs are supposed to fit waists up to 46″ (see How are Backpack Hip Belts Supposed to Fit?). Just make sure this pack fits properly if you buy it. The shoulder straps and hip belt are lightly padded and backed with mesh for moisture management. The extra blue camera pocket and whistle are not included with the pack. The hip belt pockets are large and made using the same Spandura mesh used on the rest of the pack. They’re not intended for off-trail use, so don’t try bushwhacking with this pack or they’ll get ripped up. They’re also not waterproof, a consideration if you hike in rainy weather and like to store a camera or cell phone in a hip belt pocket. Both the hip belt and shoulder straps are backed with mesh for perspiration control and comfort, However the hip belt padding is relatively thin and unobtrusive, which I consider a good thing because it adapts to your hip shape better than heavy padding. The shoulder pads also have plastic rings to attach a GPS or pocket to the straps, hose control loops to keep a hydration hose in place, and load lifters which are anchored to the top of the pack frame. The Katabatic Gear Helios 55 is a well-appointed cuben fiber pack good for multi-day backpacking trips and alpine hikes when you need to strap a lot of extra technical gear to the outside of your pack. The pack carries a bulky load very well but also compresses down nicely when you need less capacity. The combination of a single aluminum stay, firm foam padding, and the sewn-on hip belt wings make for a very responsive carry. I also like the fact that the pack is fairly narrow at the hips but flares out a bit higher up, making it easy to use ski poles. I rate the maximum comfortable load at 30 pounds, but you can certainly take it higher with careful packing. My only caution is the stretch mesh on the hip belts and the bottom of the side pockets which is likely to rip if you take the Helios 55 off-trail into dense or thorny vegetation. But for on-trail use, the Helios 55 is a delightful cuben fiber pack that can be used year round for multi-day backpacking, section hiking, and long distance thru-hiking. Disclosure: Katabatic Gear loaned a Helios 55 to Philip Werner for this review, but he has to send it back. Next Is it Better to Buy a Sleeping Bag with a Gore-Tex Shell or to Use a Bivy Sack? I’ve been using this pack for the last year and have been really impressed by it, I would definitely recommend this pack to others. I got it to replace a new model Gossamer Gear Gorilla that I used on the northern 500km of the Israel National Trail last year that fairly quickly developed holes in the mesh fabric, I wasn’t convinced by the durability of the robic fabric either though had no failures in the actual robic. I’ve used the Helios 55 in tougher conditions than northern Israel (Tasmania and the Larapinta Trail in the Outback) over about 500km and it too is developing damage in the side mesh pockets though not as bad as the Gorilla and I have no doubts about the superior durability of cuben fibre over robic. More cuben in the side pockets with a stronger mesh. Cuben waist belt pockets larger than than the current mesh ones. Stronger bladder retainers on the shoulder straps as one ripped on first use. A shoulder strap that would make carrying a heavier load more comfy. Ordinary webbing on the load lifters as the current webbing is prone to slipping. The current mesh pockets are an okay size (I just like bigger) and the mesh there is likely to be under less stress and therefore longer lasting than the side pockets. The shoulder straps are generally very comfortable but I found with all my gear and 12 days food it wasn’t as comfortable (though still very stable) as it could have been with slightly wider straps though it was perfectly comfortable after I’d eaten a few days food. I added a Zpacks cuben stick on loop to the top of the front pouch and added some light shock cord to allowed me to secure the pouch contents a bit better by attaching the shock cord to the webbing strap that goes over the pack. The quality of construction and stitching is excellent with the exception of one of the bladder retainers (which is probably just my bad luck) and I don’t know of a better pack (in this size / weight class) on the market having used Zpacks, HMG, Gossamer Gear and others. I’m going to start the PCT in May and am planning to take this pack, my only concern being the durability of the mesh and how long my field repairs will last before it needs replaced. Yeah, it really is a very nice pack but could be made a bit tougher. We both agree on that but i reckon we probably use packs harder than most people. As for Robic. It’s just nylon. I’ve slashed it up plenty. Nothing that special in terms of added durability in field conditions. Cuben fiber is a much better choice for rough use, but you are going to pay $$ for it. I tend to do long distances so appreciate tough and light and I’m happy to pay for it, there’s nothing worse than being on a trail especially in a foreign country when something needs replaced unexpectedly. Having said that I want things as light as I can get them and my current multi-day sub zero (to -5ºC which is about as cold as it gets here in Tasmania) base weight is less than 4kg which is about 20% more than five years ago, the gear is much the same I’ve just gone for slightly more rugged or slightly warmer items. Liam, great point. I also value rugged. I want my gear to last, not so much from the expense but the joy that using a well made tool provides. Looks like an almost identical suspension, back panel and hip belt to the Boreas Buttermilks. It does look like the Boreas Buttermilk back panel and belt. Philip — the belt looks somewhat flimsy. Maybe not as supportive as the offerings with the double belt (high-low) adjustments available from Zpacks, ULA, SMD Fusion, etc. What do you think? But it is very different. As for the hip belt, I actually prefer this kind to the two strap belts from the other vendors which I feel slip on me. The only reason they’re used by SMD and ULA is because they same guy designed the packs. He used what he was familiar with. but to each his own. If it fits, run with it. From the picture above it looks like the Helios roll top aligns with a strip of velcro in the middle. What’s your take on roll-top backpacks closing with velcro vs. snaps vs. just a wide stiffener, in terms of alignment and getting a tight seal? I like to avoid velcro on packs if possible because it snags on everything (unless it’s omni tape). The Velcro doesn’t bother me and it doesn’t catch on my stuff. What I dislike is having to roll a top multiple times to close it…not on this pack, but others like the Mountainsmith Scream 55 which I review next. That’s just a waste of extension collar and fabric weight. Seems pretty pointless to make a $350 cuben fiber roll top bag that’s not actually waterproof. There’s (much) cheaper bags which are. Name another CF pack that’s waterproof. HMGs and ZPacks aren’t. It’s roll top as it’s a simple and light closure system and allows flexibility in carrying extra items such as food at the start of a trip. I wouldn’t trust any cuben pack to be (or stay) waterproof even it was seam sealed, I use various waterproof drybags (it’s good for pack organisation too) for things that need to stay dry and accept and have experienced failures with them too. Especially the really ultralight cuben and 15d nylon ones which is why I now use 30d drybags from Exped or Sea To Summit. Hi Philip. What about that comment on external frame backpacks? Have you done a review of any lately? Ever? I’ve done 4 external frame packs reviews (that I can recall…2 from zpacks.com and 2 from seek outside) and I have another one in my review queue. If Kelty or alps mountaineering wanted to sell more external packs they have the wherewithal to create demand. What are your thoughts on this pack vs the hmg? They seem so similar. I’ve got a katabatic gear flex qulit and really appreciate his craftsmanship. Any experience with the v40 Fabric? I recently got an opsprey exos 58 and think it’s OK but am very curious about the katabatic and also the seek outside divide. The Helios is just a bit nicer than the HMG 3400, which would be a comparable size. I prefer the 3400 because it’s so much like the 2400, which is the main pack I use. I literally take the frame stays out of my 2400 and put them in my 3400 when I need a higher volume pack. This is confusing. Did you mean to say that you move the stays from the 3400 to the 2400, in order to create more volume in the 2400? I was just trying to explain that the 3400 is identical to the 2400 except for the fact that it has a longer extension collar. The stays used in both packs are identical. I transfer them from the 2400 because they’re bent the way I like them.